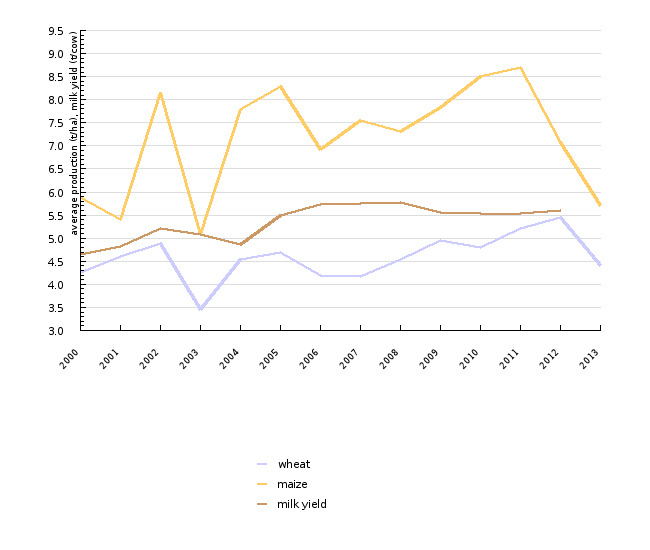 Intensity in agricultural production is moderately increasing. Statistical Office of the Republic of Slovenia, 2013; claculations by the Agricultural Institute of Slovenia, Institute of Macroeconomic Analysis and Developmentm Slovenian Environment Agency, 2013. Past experiences show that the intensification of agriculture in uncontrolled conditions is a process which can present one of the most extensive burdens on nature and the environment. These facts have made it one of the focal themes in strategic and programme documents of the European agricultural and environmental policy. The Water and Nitrates directives are the key environmental instruments limiting the possible negative consequences of intensification in agriculture. Agri-environmental concepts also present an important element of the reform of the agricultural policy. The importance of the protection of the environment in agriculture is increasing by means of the so-called cross-compliance and introduction of other measures for the achievement of ecological standards. Farmers eligible for financial support have to observe the prescribed standards regulating the environment, safe food and well-being of animals. They must also maintain their agricultural land in compliance with good farming practice. The importance of environmental concepts and measures in the framework of the rural development policy is increasing as well. Slovenia, too, committed itself to observe these rules by planning the implementation of the agricultural policy reform. In Slovenia, the level of intensification in agriculture is moderate, focusing primarily on improving labour productivity in agricultural production, i.e. reducing the input of labour per unit of area or product. agricultural and environmental policies which develop instruments to limit its negative effects. 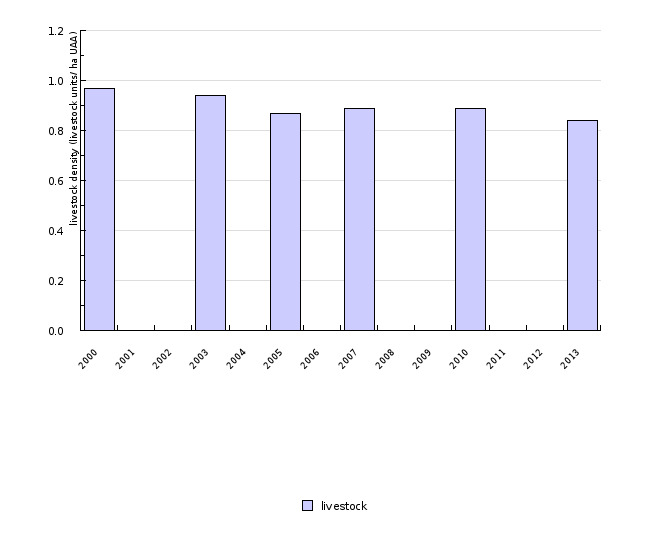 livestock unit/ha) in the 2000- 2013 period alone. production per dairy cow (milk yield) increased by more than 25% to stand at 5.6 tonnes of milk per cow in 2012.
wheat and maize per holding), whereas the increase in hectare yield is less significant, which is due to the high dependence on weather conditions.